As old enemies unite, team RWBY may also soon find out that shelter doesn’t always guarantee safety. After taking their time with getting the story up to speed in previous episodes, ‘The Coming Storm’ still is slow in terms of moving the plot and developing characters, but it also treats us to an entertaining fight between two fan favourites, and gives the audience an enticing reveal. The episode opens up with Cinder Fall successfully obtaining the information from lil’ Miss Malachite. However, once she leaves to continue tracking down team RWBY, lil’ Miss reveals that she is aware of her identity, telling her that “it’s not often a single client brings me double the business”, and that’s where Neo steps in. This is an interesting turn of events, as the last time Neo was in the show, she was tricked by Ruby and presumed dead at the conclusion of Volume 3. What follows is a short but intense fight sequence between the two, the kind which were frequent throughout the first few volumes but has been lacking in the last episodes of this season and makes a nice change of pace to the weighty dialogue episodes. There is also more comedic writing in this scene, with the women flying through a window when asked to take the fight outside, an equally welcome change to otherwise standard writing. The fight concludes with Cinder revealing her Fall maiden powers, and convincing Neo to join her in her hunt for Ruby. This shows that Cinder has gotten stronger since we saw her struggling in episode two, but we also see that Neo is now sporting Roman Torchwick’s hat, who was another antagonist defeated at the end of Volume 3. Unlike Neo though, he doesn’t survive, and this is further confirmed in the RWBY wiki, stating him as ‘Deceased’. So, if fans are expecting another surprise reveal from a beloved character, they shouldn’t hold their breath. Additionally, what is going to happen with Lil’ Miss Malachite? Now that Cinder has her information, will we see her again or was she just a throwaway plot device to get Neo and Cinder together? Back in the tundras of Mistral, things aren’t looking good for RWBY as the mystery of Brunswick Farm builds up. Ruby comments that the place looks fine in comparison to other abandoned settlements, which were either unfinished or damaged from Grimm attacks. Upon inspecting the building, Weiss stumbles across the bodies of the people who previously lived in the farm. Though the show hasn’t been shy about displaying death before, the is the first time in RWBY that rotting corpses are portrayed. Qrow finds more of the same in each house, “like the whole estate went to sleep and never woke up.” We also see some minor relationship development between the RWBY girls, with Ruby exploring more of the building with a shocked Weiss, and Yang trying to find transportation in a nearby barn with Blake. It is between Yang and Blake that we see now some key development: Yang still is suffering from PTSD flashes, and Blake confirms that the previous relationship she shared with Adam Taurus was abusive. 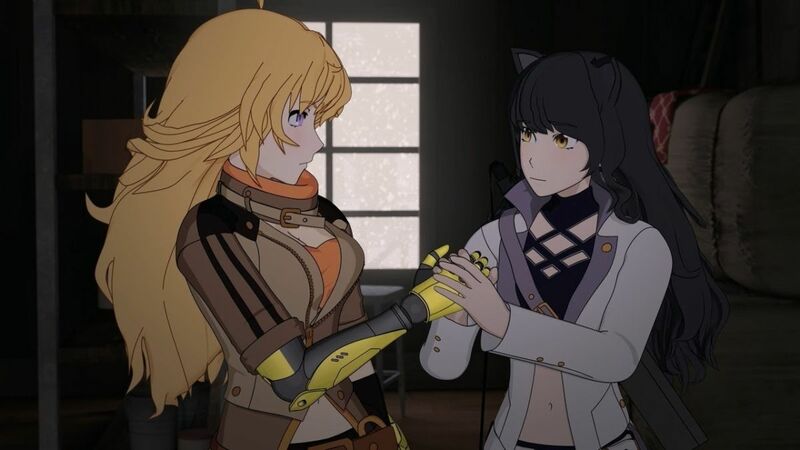 Blake tries to comfort Yang and at first, it seems to be working until she says, “I’ll protect you”, which causes Yang to shut down on her. This is a simultaneously touching moment for Bumblebee shippers, and an interesting moment to analyse. Though Yang doesn’t get angry when Blake says she won’t leave, a move which she has done before, it’s the line about Blake protecting Yang that upsets her. Perhaps why Yang gets annoyed with Blake is because Yang trying to protect Blake in Volume three was what caused her to lose her arm, and it hurts her that something similar might happen to her team mate on her account. Meanwhile, Ruby and Weiss stumble across an abandoned bar, something which Ruby wishes they hadn’t found, commenting on her uncle Qrow’s alcoholism and his current state. Weiss herself also starts to doubt the group’s mission, saying that it may be pointless to keep going if they can’t destroy Salem. There’s a lot of key terminology coming up in reference to Salem: using words like ‘kill’ and ‘destroy’ is a strong hint as to how RWBY may use another way to stop her, maybe imprison her or summon the gods to deal with her. They continue exploring and find food for the group. However, they also come across a locked cellar. Thinking nothing of it, Ruby and Weiss gather up the provisions for the group. The episode concludes with the doors of the cellar moving. This is very reminiscent to the pilot episode of a totally different show, The Walking Dead, where the protagonist Rick Grimes finds a locked door with zombies inside. Additionally, each new volume of RWBY has always made a point of introducing new and stronger Grimm for the heroes to battle. Also, the girls have complained once or twice about feeling uneasy about the place and being tired. This may be just a throwaway comment considering their long journey, but also, the previous occupants of the farm all died in their beds sleeping. Will team RWBY be facing some sort of zombie Grimm that, unlike the monsters we have seen before, preys on them at their most vulnerable? All we really know is that the volume now seems to be going more towards a more sinister, horror-esque direction, similar to what the creators did with the Knucklavee in Volume four. On a quick side note, how couldn’t Weiss or Ruby hear the metal door bang? For an episode which only lasts fifteen minutes, The Coming Storm is a mixed bag. The fight scene with Cinder and Neo is a great callback to the original action scenes that helped the show gain traction, and also features some solid comedic lines. The fearful anticipation of just what’s hiding under the building is enough of a reason to keep the fans watching, but the middle needs a little work: though the creators might have thrown Bumblebee fans a wink, a lot of it going over what the audience may already know as they go through mundane tasks. It’s slow and needs to pick up the pace. Hopefully, whatever is in the cellar will give the volume that boost. ‘The Coming Storm’ still suffers with some of the pacing issues of previous episodes, but treats fans to a spectacular fight scene in the style of the original volumes, and gives something for fans to look forward to.